PTFE Coated Fiberglass Industrial Tapes are fiberglass fabric impregnated with PTFE dispersion and coated with high-temperature, pressure-sensitive acrylic or silicone adhesive. 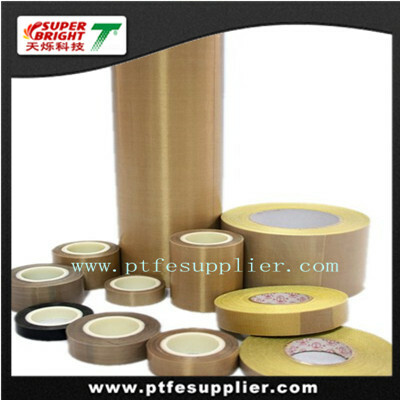 PTFE Coated Fiberglass Industrial Tape are the versatile performer. Industrial grade is excellent for accessory applications in packing, such as chute linings, sliders, guide rails, cover tapes, etc. This dimensionally stable product resists tears, punctures, abrasion and wear. It will not cold-flow under heavy loads. They are also frequently used by the packaging industry as a release surface on heat sealers, blister formation and form-fill-seal equipment. The durability and anti-stick properties of these Industrial grades makes them an ideal material for the lining of guide rails, chutes and slides. The high temperature capabilities and non-stick properties allow them to perform as an excellent release surface in the composite aircraft industry.